The Cabinet Committee on Infrastructure (CCI) has cleared a proposal to upgrade 20,000 km roads in various states under its flagship programme National Highways Development Project (NHDP), Phase IV. The estimated cost of the project is likely to be around Rs 25,000 crore. Earlier the Cabinet had approved 5,000 km of roads under NHDP phase IV A and of this, 2,000 km were approved by an Empowered Group of Ministers on highways to be 4-laned. 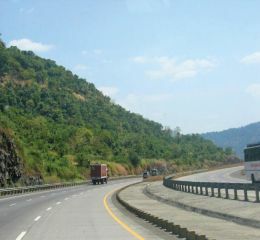 The new proposal clears an additional 2000 km of highways to be converted to four lanes. The CCI has also approved the proposal for tentative list of 8,525 km of roads under the build, operate and transfer (BOT) toll mode. The build-operate-transfer (BOT) model is an arrangement where the private developer builds and operates the roads and then transfers it to the government. Any risk involved in the projects is borne by the private developer. There are two types of BOTs based on returns- one based on tolls and the other on a government annuity payout. The self-funding toll model is preferred as annuity payments become a big drag on the budget. The government is keen that the BOT model be increasing used to cut down the fiscal deficit.